Sit More, And You're More Likely To Be Disabled After Age 60 : Shots - Health News People tend to relax as they get older, and most people sit more. Each extra hour of sitting increases the odds that they won't be able to get out of bed or do other daily activities. Sure, it's relaxing. But all those hours on the sofa may make it hard to actually stand up on your own. The more you sit, the less physically active you are, which can lead to all sorts of health problems, including an early death. But too much sitting increasingly looks like a health risk all its own. 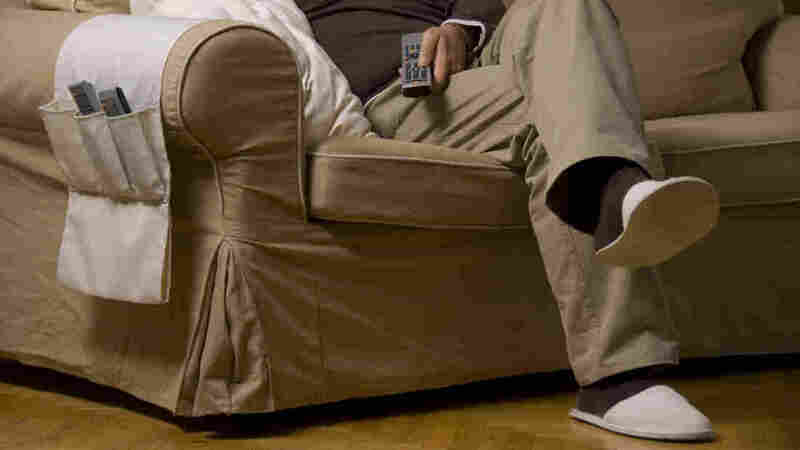 Researchers at Northwestern University say that for people 60 and older, each additional hour a day spent sitting increases the risk of becoming physically disabled by about 50 percent — no matter how much exercise they get. Today, over 56 million Americans have some kind of disability, according to the latest census data. Nearly half of people 65 and older have a disability, which can include difficulty doing basic self-care tasks and difficulty leaving the home alone. "It threatens people's independence, and it also accounts for a large chunk of health care dollars," says Dorothy Dunlop, a public health and medicine researcher who led the study. Every $1 in $4 spent on medical care is related to disability problems, she says. This study uses data from the 2003-2005 National Health and Nutrition Examination Surveys, which recorded the health, socioeconomic status and access to medical care of 2,286 adults ages 60 and older. Also noted was how much difficulty they had with basic tasks like getting in and out of bed, eating and getting dressed. Nearly 4 percent of the people said they had a lot of difficulty with at least one of those activities of daily living. Participants also wore accelerometers around their waist for seven days to record how much time they spent sitting and how much time they spent doing moderate to vigorous activities like speed walking. The survey showed that on average, people spent nine of their 14 waking hours sitting, with almost two-thirds of the sample spending at least nine hours sitting. People who spent more time sitting were more likely to become disabled when compared with people with similar health and exercise habits who sat less. Each daily hour spent sitting increased the odds of problems with activities of daily living by 46 percent. Doing more exercise didn't erase that risk. So if sitting for 12 hours per day gives you a 6 percent risk of having a disability, an extra hour each day may up your likelihood by 3 percent, Dunlop told Shots. The increase in risk from sitting was even greater among subgroups. For two women at the same age and with the same profile, the odds would increase by 60 percent for each extra hour a day of sitting. The results were published Wednesday in the Journal of Physical Activity & Health. Dunlop calls the result a "smoking gun" but says it is not yet definitive. "This is only one slice in time and it doesn't allow us to say that being sedentary causes these poor health outcomes," she says. "But it is very strongly associated." Even so, what sitting does do to your muscles and blood circulation isn't pretty, whether you're 60 or years younger. "When a person sits for an extended period of time, your muscles burn less fat and your blood tends to flow more sluggishly," Dunlop says. "And on top of that, when you slump in your chair, then your back and your stomach muscle goes unused." The key to maintaining your muscles' ability to do these basic, low-intensity task is keeping them working, says Marc Hamilton, an inactivity physiologist at Pennington Biomedical Research Center in Baton Rouge, La., who was not involved in the study. "It takes a long duration of using your muscles throughout the whole day," Hamilton says. So exercising for 30 minutes a day doesn't necessarily offset the hours of sitting. "Get nonfatiguing activity in as much as possible," he says. That can be as simple as walking around the office, or parking your car at the far end of the parking lot or even just standing up while talking on the phone, Dunlop tells Shots. And self-monitoring devices like pedometers and FitBit wristlets, both of which give you feedback about your activity, can be extra helpful in keeping you motivated to move.